Get Trello – this is an indispensable app for list making and staying on track. I mentioned this app in my last post but I have put it in again here as it has been so core to our bicycle travel preparations. Start early – as regular readers will know, we started preparations over a year ago. At the beginning it was more to do with rationalising the concept of taking an adult gap year. It was all big picture stuff, thinking through the ‘whys’ the ‘whats’ and the ‘hows’. We then moved into researching the detail and the equipment, and eventually the actual booking and purchasing. Use a timeline – we used an app called Timeband. It sort of worked but I wasn’t overly impressed with it. Pen and paper would work just as well. The key point is to sit down and work out what needs doing when, so that you can work backwards and structure tasks. For instance we knew roughly how long it takes to order a custom Brompton so we were able to work backwards and plan when we needed to be researching and finding a supplier who we could order them through, when we needed to make final decisions on the specs for the bikes and whether we wanted to go electric or not. Once you have the big items such as researching and booking flights, researching and ordering important pieces of equipment (at sale prices) and setting savings goals, you can slot the smaller items in between. We soon found that we had a pretty busy year of preparation and I was quite surprised how early we needed to kick off some of the items on our list. Don’t ignore mental and third party preparation – one of the things I have realised is that providing time for everyone (including ourselves) to get used to the idea has greatly helped with smoothly arriving at this point. At our age, there is a ripple effect when you make a decision like this that affects others and I think it is best to allow time for others to adapt. When I took my first gap year, I just needed to give notice on my flat and job, pack up a few cardboard boxes, have a farewell drink at the pub and get on the airplane. Life has got a lot more complicated since then. Rationalise and get rid of stuff – go through the all your cupboards (start early) and you will find large amounts of ‘stuff’. Stuff that you haven’t used, or indeed seen, for years. Be ruthless. Get rid of it. I used a 2 sweep system where I went through a room and removed everything I really didn’t want and then went through the stuff again a little while later to pare down even further and tackle the difficult stay/go decisions. The second time around, think to your self “would the person I want to be now own this stuff?” The two sweep approach seemed easier and was more effective that the single sweep approach. I had three piles, keep, sell and throw out. The keep went back in the cupboard, the sell was listed on Trademe and the throw out was recycled if possible and landfill as last resort. Keep thinking to yourself “what will I think when I open this box in a years time.” Will you smile and think, “I’ve missed this” or will you think “what on earth did I pack and store this for?” Do you really have a deep emotional attachment to that unused tube of toothpaste? Or should you donate it to a needy daughter who now suddenly has to BUY stuff like that! ?Then put everything you’ve decided to keep in one place and lock the door before it all falls out! Sell, sell sell – selling is great. People give you money for things you don’t want. Then you can buy things you do want. I’m a big fan … but don’t underestimate how much time and effort it takes to sell through an online platform like Trademe or EBay. We found that it takes time to shift large amounts of stuff. Every week you have to write the descriptions and take the photos and then there is the whole ‘organising pickup or boxing up and posting items’ part. And for some unknown reason, the post office has stopped selling boxes … What’s that about? Don’t rely on your husband to do any of the stuff he said he would. I found that it was best just to assume total incompetence and double check everything. The up-side is that sometimes, you’re pleasantly surprised. The Husband is not a born organiser and asserts that he handed over all responsibility on that front with the wedding ring. It’s a good job he’s good at cooking and lifting heavy stuff! Know that no matter how much time you allow for preparation, you WILL still be doing last minute jobs at midnight the evening before you leave. Also know that last minute things will go wrong … the Husband lost a screw from his glasses and a lens dropped out, which left us crawling around on the floor with a torch to no avail. Running repairs were implemented using string and elastic bands until the next morning when time had to be found to fit in an optometrist visit. There was also the cash point card debacle – it accidentally got cut up …. don’t ask! Just plan for ‘sods law’ to rule. 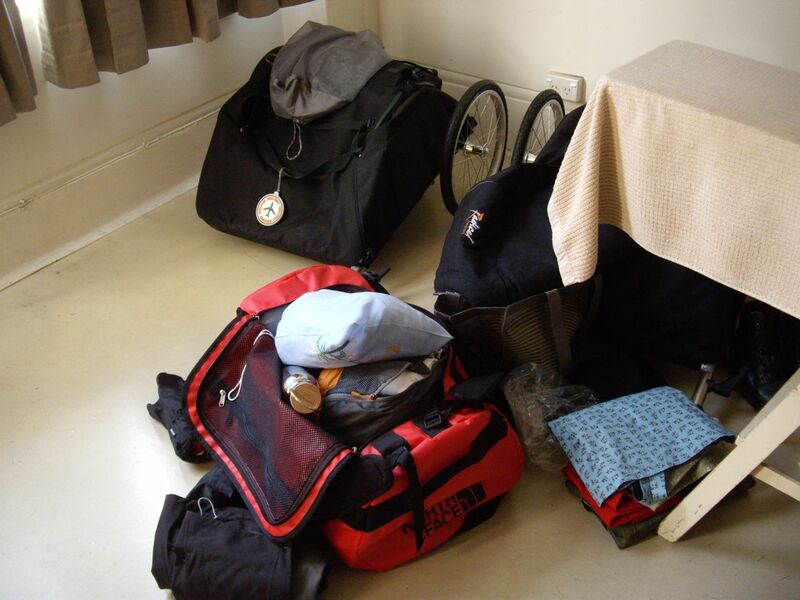 Remember that bags are smaller on the inside – all your luggage should logically fit in … you’ve ‘eyeballed it’ and you were confident it would fit … it went in when you did a ‘test pack’ a couple of weeks ago BUT now, the morning you leave, somehow it doesn’t. Oops, we might have forgotten that the wheels would have to go INSIDE the bags to get them on the plane. FAIL! Thank god for 7kg of hand luggage. 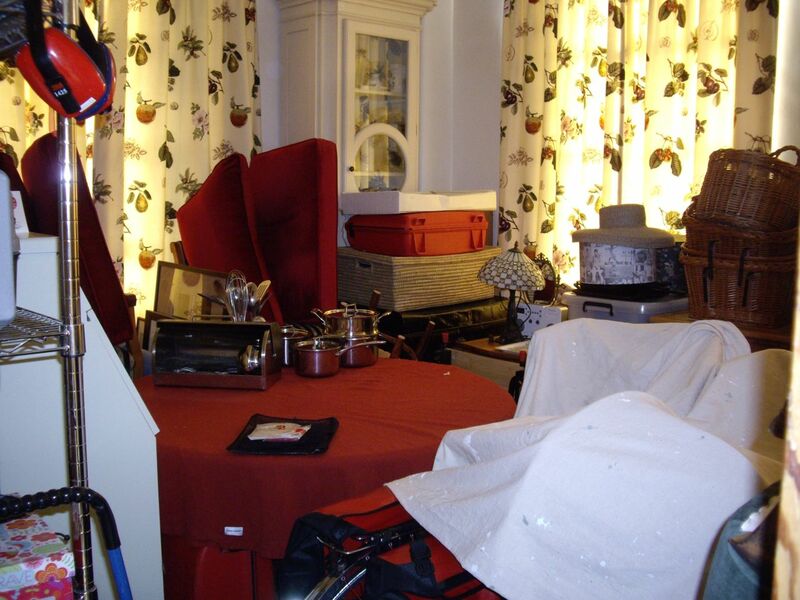 The end of the preparation phase is an anti-climax – After a year of preparation, you stare at the two bags sitting on the floor of an empty room and wonder what all the fuss was about and how on earth it took all the effort it did. Now the next bit begins … the Trip itself!